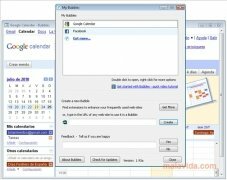 Bubble may be the application that manages to make sure that opening your browser and having tabs open with the same services all the time isn't the only thing you use your PC for. With this software, these services will almost become desktop applications. 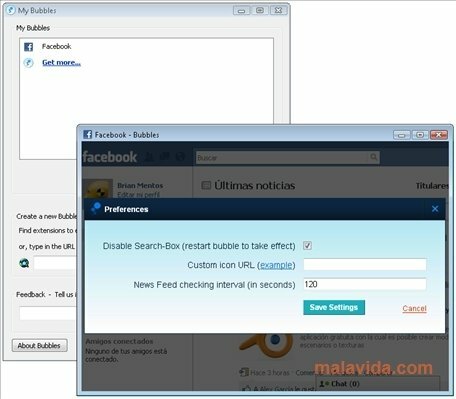 How Bubbles works is very simple, once we download the program we'll receive the scripts that will allow us to use the Google, Facebook, SlimTimer or GrooveShark services. Bubbles will make sure that each website has its own shortcut on the desktop, in the system tray and its own browsing frame, so as to be able to use them without having to resort to opening our browser. Furthermore, thanks to the fact that it works by means of scripts, we'll be able to modify the existing ones or create new ones to manage improved functions or integration. To make this task easier, Bubbles includes a large API that will allow the most advanced users to do whatever they want with the program. 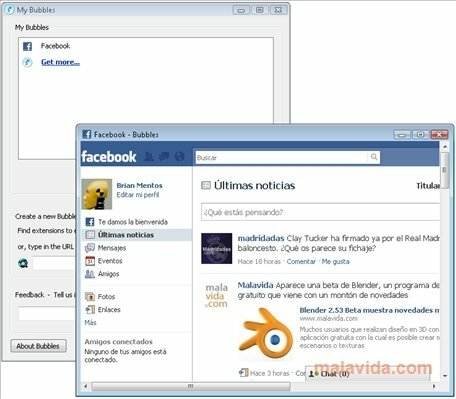 Among the advanced functions of Bubble we'll have the notifications of each application or service, the possibility to Drag&Drop files, and other small options that will make Bubbles an essential program on any computer. This download requires an active Internet connection.